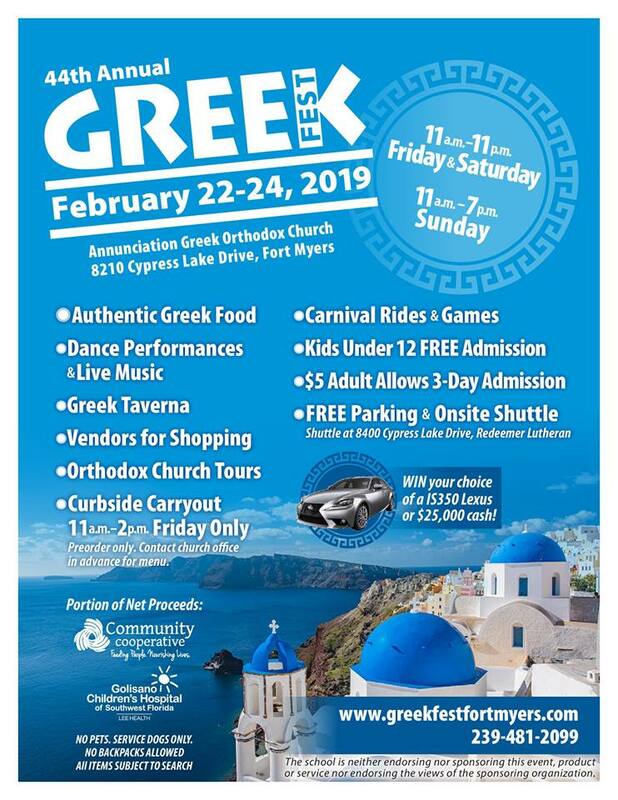 Annunciation Greek Orthodox Church will be holding their 44th annual Greek Festival from Friday, February 22nd through Sunday, Feb 24th at the the church grounds in Fort Myers. 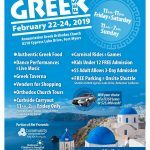 The weekend long festival will feature delicious food including authentic Greek dishes, live music by the Greek Company Orchestra, dance performances, a midway with carnival rides for all ages, Car or $25,000 raffle, and much more. Free parking is available at Redeemer Church (directions) with free shuttle service to the festival grounds. Pay one price rides wristbands, good for unlimited rides on the night of purchase, are $20 each on Friday and $25 per wristband/per day on Saturday & Sunday. 3-Day Unlimited ride wristbands are $40 each and are only available in advance. See this page for details.